The average American homeowner pays $2,535 for oil heat and $732 for gas over the October to March winter season — that’s a lot of money, and there are ways to bring that down. When I was a child, my parents would fill a hot water bottle with boiling water and leave it on my bed before I got in. It heated up the bed quickly and was fun to cuddle — and of course, it was very inexpensive. These days, whole house heating systems, electrical blankets and electrical heaters are much more common, and the environment is paying the price. In the U.S., most electricity, including electrical heating, comes from fossil fuels like coal, natural gas and petroleum. At least one-third comes from coal in 2015, which is the most contaminating of all fossil fuels. Electric resistance heating like electric furnaces, electric wall heaters, electric space heaters and electric baseboard heating is also the most expensive way to heat a home or office, even beating central oil furnaces. Heat pumps use about half the energy of resistance heating, and therefore cost about half the amount as well, but even they contribute to a carbon footprint. Natural gas heating is also something to be wary of: when gas is extracted from the ground, much of the methane that it’s made up of (along with other hydrocarbons) is released into the atmosphere. Fracking — one of the newer and most destructive methods of extraction — is even worse, seeing both methane released and groundwater polluted. This isn’t technically an alternative, but if you have to use electric, oil or gas heating, be sure to insulate your home tightly, keeping windows and doors (both entrance doors and room doors) closed with no gaps, in order to minimize how much money you spend and the environmental impact of your heating. If possible, try to heat just the smallest room, and stay in that part of the house only (for example, heat just your bedroom at night when you sleep). You can block drafts with weather stripping, pool noodles, rolled up towels or your own homemade draft stoppers. Plus, caulk is great for sealing off windows. Not attractive perhaps, but bubble wrap on your windows will cut your heat loss in half. These bottles can be used while you snuggle on the couch, while you sit at the desk working and in your bed. Wide-mouth bottles are the easiest to fill up, and a soft cover over the water bottle can ensure the heat escapes gradually. A lot of thin layers, rather than one or two bulky layers, will actually insulate you better. Wool is great for staying warm, as are thick socks or slippers, and flannel sheets and a down comforter will keep your bed warm too. Personally, I’m working at my desk with layers of clothing and a blanket on top and I have no need for any other kind of heating. Close-fitting hats and knitted caps (also known as beanies) are brilliant as well, and a neat little trick is to put your clothes on as soon as they come out of the dryer (though from an energy-saving perspective, you’re better off just hanging up your clothes to dry instead of using a dryer). Just the process of cooking can heat you up, as can some healthy hot soups, teas and other hot meals. When you’ve finished using the oven, leave it open so its warm air can fill the room. 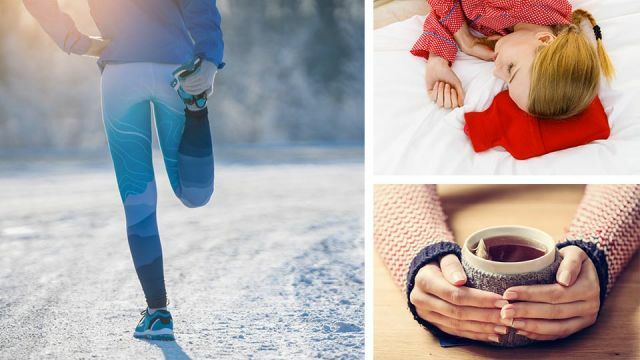 Beyond eating hot foods, eating well can help your body handle the cold: consuming calories and keeping your blood sugar up at a reasonable level will give you the energy you need to keep warm. However, if you are already cold, alcohol will drop your core body temperature. If it works for you, exercise, walk around, play games and keep moving — that is, generate your own heat. This works because, as you move, your muscles deplete stored energy. Then, this signals the muscles to combine oxygen with a chemical called ATP, which creates heat as a byproduct. Heavy wool or fleece drapes work wonders in the winter, but be sure to open them during the day to let the sun in. Natural sunlight is the cheapest form of heat there is! For some people, especially those living in the far north, many of these methods may not be enough. But used in combination, perhaps you can stop using costly heating altogether… or at least use it a lot less. What are your heating secrets? Hey Buddy!, I found this information for you: "6 Super Simple Ways To Keep Warm And Save Money". Here is the website link: https://www.thealternativedaily.com/6-super-simple-ways-to-keep-warm-and-save-money/. Thank you.